The Jack Perrin papers span the years 1919-1960 (bulk 1920s-1930s) and encompass 1.3 linear feet. The collection is composed exclusively of scenarios and scripts for around 30 Perrin films, including nine Universal shorts. 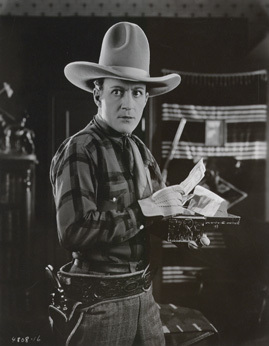 Primarily Westerns, the titles include "Canyon Rustlers" (1925), "45 Calibre Echo" (1932), The "Go Get 'Em Kid" (short, 1929), "The Jack of Hearts" (short, 1919), "Plunging Hoofs" (1929), "The Rage of Paris" (1921), "The Reckless Ranger" (1937), "Ridin' Law" (1930), and "Starlight, the Untamed" (1925). A continuity by Carl Krusada for "Heroes of the Wild" (1927) is the only serial represented. There are teleplays for single episodes of "The Alaskans" and "Perry Mason." Jack Perrin (1896-1967) was born in Three Rivers, Michigan. His family moved to Los Angeles in the early 1900s. Perrin appeared in several two-reel Triangle Komedies at Mack Sennett Studios in 1917. Perrin's burgeoning career was interrupted by World War I, during which he served in the U.S. Navy. After the war, Perrin appeared in his first feature, "Toton" (1919), directed by Frank Borzage. Over the next twenty years he appeared in more than a hundred Westerns, Western serials, and Western featurettes. Among his films are "Blind Husbands" (1919), "The Lone Horseman" (1923), "The Water Hole" (1928), and "The Wrong Road" (1937). Perrin and William Berke formed a production company that produced several mid-1930s Westerns starring Perrin. As a character actor, Perrin appeared in dozens of films, including "The Hunchback of Notre Dame" (1939), "A Double Life" (1947), "Sunset Blvd." (1950), "Giant" (Warner Bros., 1956), and "Flower Drum Song" (1961). Before he retired in the early 1960s, Perrin appeared in character roles in episodic television.